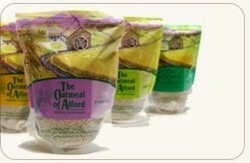 The Oatmeal of Alford would be thrilled to hear from our oaty enthusiasts. Please get in touch via the facebook link or using the contact page on this site. 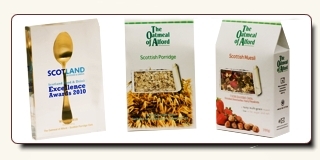 We would love to hear about any interesting you may have, such as a relative who used to work at our mill or fun recipes, or even tell us if you have any ideas as to how we can make Oatmeal of Alford even better for you. We have two new breakfast cereals which are joining our Oatmeal of Alford family. Award winning Scottish Porridge Oats and Scottish Muesli with Succulent Strawberries and Hearty Hazelnuts. Both are made using only the finest ingredients which gives them their delicious flavour. Please look out for us over coming months. Spoff Healthy Highland Cereals are here! We're delighted to introduce the Spoff family of mueslis into our range of products. We have an exciting range of cereals already on our web-store, such as Muesli with Pineapple & Ginger, or with Blueberry and Cornflower. We also have cereals suitable for those on a low Gluten / Gluten-free diet as well as a choice of Organic options. Last year, Si & Dave; better known as "The Hairy Bikers" came to visit Montgarrie Mill in June last year as part of their Food Tour of Britain. Our open fire used to heat the kiln came in very handy as the two chefs dried off after a long drive to Montgarrie in some very heavy rain. Our millers Gwen and Ritchie then gave a tour of the mill and the bikers even helped in the start up before sampling some fresh Oatmeal made on site. From The Leopard: March 2010. Each month, my grandfather left Kemnay and drove a few miles up Donside to buy a bag of oatmeal. He had a flame red Austin 1300 which made the journey so many times that it knew its own way to Montgarrie. Once parked in the grass beside the mill lade, Grandfather passed into the mill’s dark interior, where every surface was covered in a fine white stoor of oat flour. After a brief transaction, a large bag of the Oatmeal of Alford was hefted into the car’s boot, to provide for the morning porridge. The scene at home was familiar throughout Scotland: the hottering pot, wooden spurtle, and steaming bowl were essential to a generation of Scots for whom processed ‘Porage Oats’ are anathema. Although water has been put to work milling everything from gunpowder to slate, meal mills are a characteristically Scots tradition which extends back in an unbroken line for over 800 years. Montgarrie truly is the last survivor. 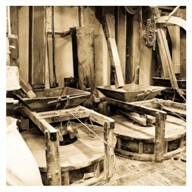 Many mills were set up by monasteries and local lairds, and run on their behalf by artisan millers. In fact, the base course of the current mill at Montgarrie is actually part of a previous mill that dates back to Jacobite times, although legend has it that there’s been a mill on the Esset burn since the Bishop of Aberdeen built one in 1317. All of Tullynessle was owned by the bishopry at that time, and from its roots in the Middle Ages, the land which the current mill sits on was feued in November 1878 to James Wilson by the Reverend Leith. 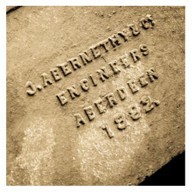 Building work started in 1882, organised by The Aberdeen & Alford Milling Company, which ran Montgarrie for several years until it was bought by Mr Purdie, who went into business with the miller, Mr Wilson. That partnership was shortlived, though, as Wilson decided to emigrate to Australia … accompanied by Purdie’s wife, and all his savings! In the aftermath, the mill was taken over by Angus Macdonald, whose family owned and worked it for over a century. The need for a new mill may well have been the result of a disastrous fire: oatmeal is combustible, and the finest powdery meal can explode with a mere spark, or even friction against a surface. Certainly, the kiln side of the current mill has burned down twice in its history – the last time was in 1955, after which the roofs and floors were rebuilt, and the grain storage buildings were reconstructed in metal. Maltings and brewhouses face similar risks, and most are kept scrupulously clean as a result. Mills face an additional hazard, though, because they’re subject to the twin perils of fire and water. The Esset occasionally overflows its banks in winter, inundating the small flood plain around the mill. 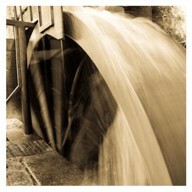 In normal weather, some of its water is diverted along a lade, and that’s where the miller’s tale begins. The mill lade was rebuilt in reinforced concrete in the 1950s, yet looks quite in keeping with the granite rubble mill behind it; ‘spillwater’ allows the miller to divert the water back into the burn, or towards the mighty wheel. Photos by Andy Hall; one of Scotland's most highly renowned photographers. Click here to view Andy's other outsanding works. The Medlock family farm is at Mains of Haulkerton, Laurencekirk; this is a fully organic farm and the central point of trading for the Oatmeal of Alford. Oats have always been the main crop, however, nowadays; this is shared with free range chickens and a rotation of potatoes, wheat and grass. Oats are dried and graded on the farm using specialised equipment before delivering to Montgarrie Mill, where the oats are turned into a very traditional product. The bi products from the oatmeal mill; chaff and husks are compressed into pellets, which are then fed to our cattle. We have a small highland fold and a pedigree herd of Aberdeen Angus, which supply the premium beef market. 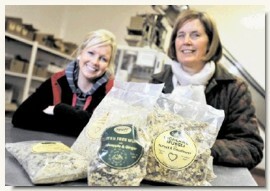 Carol Medlock (right) and Product Development Executive, Alice Stebbings with some of the Spoff Range of Mueslis. The Pelleter is powered by a generator, from which excess heat in the form of hot water is transferred to heat radiators. These in turn heat our day old chicken houses; enormously reducing our carbon footprint. 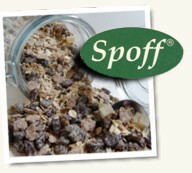 In October (2009), Spoff was acquired as a new addition, thus introducing a fine range of quality mueslis. These cereals encompass herbs such as elderflower and sweet cicely, fruit, nuts, grains, seeds and spices. All our products are delivered by our own small transport company thus ensuring safe and prompt delivery of our cereals.